The frustrated dad would send text after text, hoping for an update on his son's whereabouts, but most of the time his messages went unanswered. "By the end of last summer I thought, 'Well, there must be something better,'" Herbert, who lives in London, told CBS News. "I'm trying to find him all the time." That's when Herbert came up with the idea for ReplyASAP, an app that allows you to send urgent texts that cannot be ignored. "I wanted to be able to set an alarm on his phone — that was the gem of the idea," Herbert explained. "Alarms sound even on silent. Why can't I set an alarm on his phone in order to do that?" In order for the alarm to work, the parent must download the app and invite the child to also download it. After the child accepts, both parties can start sending each other "ASAP messages." "ASAP messages" can be scheduled or sent in real time. 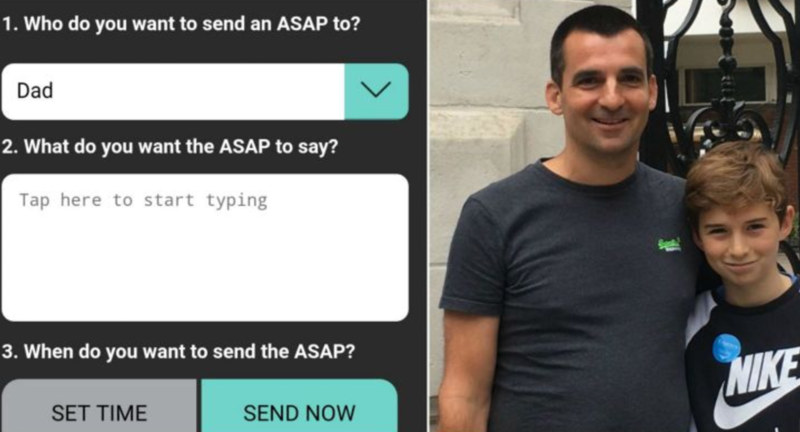 When an "ASAP message" is delivered, the app takes over the screen, interrupting whatever the recipient is doing on their phone, and an alarm will ring — even if the phone is set to silent. In order to stop the alarm, the recipient can hit snooze for 3 minutes while replying or hit "cancel" to exit the tab. The sender will then get a notification, depending on the option the recipient chooses. "I hope people in my situation use it," Herbert said. "So far I've seen an overwhelming majority of people relating to my situation. They have teenage children who don't respond to anything. And so it's something that seems to resonate." Herbert says the app isn't meant to bug your kids. Instead, it should be used for emergencies. "I told my son, 'If you want to make it urgent send me one of these. If you want to know where some socks are, send a text message and I can reply when I can,'" Herbert said. "If you have people at work who have to be on call or need to be called on quickly, you can a get message to them," he said. "In an emergency they can be contacted still." He added, "We may all have different languages and different cultures, but we all seem to have the same kind of problems. ... I launched it to help and if it helps other people then brilliant. I'm more than happy about that."